The first one was terrifying. Once you made a commitment to do it, and we’d committed right from the start to do this every single day of the Olympic games … you’ve got to do it. The video includes a look at the decision behind the very first wrap, which wanted to visualise the dawning of the Olympics in London. The Times sent a photographer out every morning the week ahead of the Olympics to photograph the sun coming up over the Olympic stadium, before it was decided a shot of the London Bridge with its Olympic rings was the better shot for the job. The video, which can be played below, also talks about the reaction to the wraps on social media from the community. This entry was posted in Photography and tagged Olympic journalism, Olympics, Photography, The Times, wrap on August 14, 2012 by Rachel Bartlett. News International has responded to reports that it has decided not to introduce a paywall at the Sun, as it has for the Times, Sunday Times, and did for the now-defunct News of the World site, denying that a decision has been made over charges. A report today by paidContent suggests that new chief executive Tom Mockridge has decided against a paywall. This entry was posted in Business, Online Journalism and tagged digital subscribers, News International, paywall, The Sun, The Times on October 17, 2011 by Rachel Bartlett. Forbes reports on encouraging subscriber stats for the New York Times, the second set of figures released since it went behind a porous paywall in March. Since then, the paper has amassed some 224,000 digital-only subscribers. Another 57,000 subscribe to replica editions delivered on e-readers like the Kindle and the Nook. On top of that, there are the 100,000 people getting e-subscriptions sponsored by Lincoln. Jeff Bercovici goes on to compare the NY Times with the Times. The Times of London launched its own, very different pay model about nine months before the [New York] Times. (Briefly: the Times [of London] has an impermeable paywall, while the New York Times uses a metered system that allows non-subscribers 20 free pageviews a month.) It only recently hit the 100,000 mark. The Times of London is smaller, but not all that much so: it has a weekday circulation of about 500,000 and a Sunday circulation of 1.2 million, versus 900,000 and 1.3 million for the [New York] Times. Importantly, the [New York] Times managed to add a new leg to its business without significantly cannibalising its existing web audience. [The site] averaged 33 million unique visitors per month in the second quarter, in line with its average for the preceding 11 months, said CEO Janet Robinson on a call with analysts. Forbes’ full post goes on to explain the challenges facing the New York Times. This entry was posted in Editors' pick, Online Journalism, Traffic and tagged Forbes, New York Times, paywalls, The Times on July 22, 2011 by Sarah Marshall. Hackers last night (July 18) targeted the Sun’s website and put up a false story announcing the death of Rupert Murdoch. The group behind the attack, Lulzsec, also redirected all traffic to its Twitter feed. 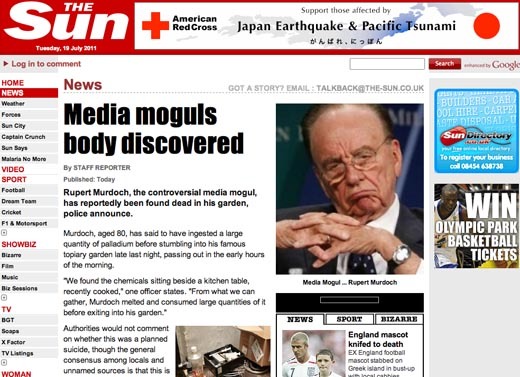 Visitors to the site were greeted by the headline ‘Media moguls (sic) body discovered’ – a story that alleged Murdoch had ‘ingested a large quantity’ of radioactive palladium, before ‘stumbling into his topiary garden’. On Twitter, LulzSec also claimed to have hacked into email accounts and began posting what appeared to be passwords to individual email addresses as well as mobile numbers for editorial staff. People trying to access the Sun website were directed to new-times.co.uk, a News International-owned domain. The hackers did not explicitly say why they hacked the site, but various tweets suggested it was linked to the phone hacking scandal. This entry was posted in Journalism, Newspapers and tagged hackers, hacking, lulzsec, News Corp, News International, phone hacking, Rupert Murdoch, The Sun, The Times on July 19, 2011 by Andy Halls. Should we ‘pay the wall’ to maintain quality journalism? Should we pay for a digital subscription if we want to maintain quality journalism? In this article on ZDNet, Tom Foremski, a former Financial Times reporter who writes about the intersection of technology and media, is urging people to “pay the wall” to “help to make an important contribution to the quality of our society and government”. We need quality journalism because: media is how a society thinks about things. Media is vital to our decision process. We are facing a media landscape that is becoming ever more dominated by garbage media and that means that we, as a society, will be making bad decisions. He argues that just because online news started out being free, it doesn’t – and shouldn’t – have to remain that way. It seems that the Geekorati believe that once something is free then it should be free forever, and that if you can get past the New York Times paywall, then you are smart. But will becoming a paid-up digital subscriber raise newspaper revenues? And what effect is digital having on falling print circulations? The Guardian’s Dan Sabbagh and paidContent UK’s Robert Andrews have both taken a closer look at News International’s claim that, despite a sharp decline in sales of the print edition of the Times, overall circulation has increased with the addition of 79,000 digital subscribers, who pay to read the Times and Sunday Times online, on an iPad, or on a Kindle, according to figures released this week. Sabbagh has made an educated guess at income from digital versus print and reckons the Times makes around £7.50 a month from each digital reader and £25 a month from those who buy a paper. Now we can apply these values to the paywall numbers. What’s been lost are 58,421 print buyers of the Monday to Saturday Times – and 74,557 readers of the Sunday Times. The blended average decline is 60,726 – and the lost revenues for each of those readers is £25 a month as discussed. That’s a monthly revenue lost of £1.51m, or £18.2m a year. (Actually it’s a bit lower because there’ll be some print subscribers paying less than the news stand rate, but never mind that – the broad principle still holds). Meanwhile, there have been 79,000 new online customers at £7.50 a month. That’s revenue gained of 592,500 a month (£7.1m a year). That’s a useful sum of money, but it is clearly not as much as the revenue lost from declining print copy sales. Our take (1): In other words, the papers notched 50,000 digi subs in their first four months – but only 29,000 additional subs in their second four months. This is a slowdown. The Sunday Times iPad app, which launched in the second period, should have bumped up these total subs slightly. The challenge now is to maintain new subscriptions at a high rate and, in time, to keep churn low – new concepts, when applied to consumer news. The Times has another challenge. It has seen a decrease of 12.1 per cent in circulation of its print edition within the past year. But is the decrease due to the fact the Times increased the cost of its print subscription or have newspaper readers moved to become digital readers? It is impossible to say but it will be interesting to keep an eye on the subscriber and print figures for the New York Times, which went behind a ‘porous paywall’ last week, easing readers in with $0.99 a month subscription rate. Its model differs from the Times in the UK, but the more the paywall model is tested, the greater the understanding of the paid-for digital era. This entry was posted in Business, Online Journalism and tagged paywall, paywalls, Sunday Times, the New York Times, The Times, Tom Foremski on March 30, 2011 by Sarah Marshall.